Our future objectives, except for any other major scientific avocations with the archival and permanent historical collections and our care for the spotlight, viewing and their safe keeping, is also our continuous offer to the contemporary art by organizing and presenting exhibitions, but also in the field of music, dance and theater with the Organization and presentation of relevant always high quality cultural events. A 10-minute walk from the sea, marking a circular distance around the port, with no street names on the island, but only with the great Roloi to guide you, you can find the The Hydra Museum Historical Archives (ΙΑΜΥ). It was founded in 1918. The building was donated to the state by Gikas N. Koulouris. The mayor of the island in that time, Anthony Lignos, discovered much material of this archive in the monastery of the Virgin Mary, which he then categoriyed. Then, up several flights of steps and with your eyes stuck on winding alleys, EBR met the Director of IAMY, Mrs. Ntina Adamopoulou - Historian & Archivist - awarded by Unesco for her valuable offer to culture. Her second award came by the The Faculty of Philosophy of the National and Kapodistrian University of Athens for Ntina’s Adamopoulou documenting research on Andrea’s Miaoulis scientific monograph. In an exclusive interview she was introduced by: The "architect" of the EU Jean Monnet had once confessed that "if he could re-start Europe, he would start from culture ...!!" , and analyses why IAMY (with its Archival Section full of records and individual folders of great personalities like Kolokotronis, J. Makriyannis, I. Kapodistrias, Miaoulis, its Museum Section under the theme of Greek Revolution with the embalmed heart of Andreas Miaoulis and its Library with more than 4,000 books many of which date back to 19th century)... consists a real treasure for the history of the island! The European Business Review magazine proudly hosts the exclusive interview of the Director of The Hydra Museum Historical Archives, Mrs. Ntina Adamopoulou - Historian & Archivist - awarded by Unesco for her valuable offer to culture. EBR: The Historic Archive and Museum of Hydra (IAMY) has many temporary exhibitions of a great success. This summer painting exhibition of Alekos Fassianos "His French Creations" was my first thought over that, could you please specify a few points about the criteria of choosing collections and exhibits and what factors make some of them to be some remarkable? NA: The purpose of organizing a temporary exhibition is in one recreational, however I think is undoubtedly and educative. Temporary exhibitions are in my opinion a literal communicative medium of our Archives- Museum and we have to integrate to the objectives and basic principles of our operation. The experience of a visit to our exhibition premises with the transmission of messages relating to the featured exhibitions to the public of our visitors are certainly unique!. Thus the exhibition collections that we choose and their constituent projects we ensure that all of the above are met. We ensure that the presentation of works or objects of an exhibition being made in ways that allow several alternative interpretations. Concerning the factors that make our exhibitions significant, I believe, foremost among all, is the way highlighting the works of the collection through the General presentation, the selected and proper lighting but also the accompanying instruments that we use: the graphics, multimedia (image, sound, computers, maps, blueprints, etc) yet – even the right color on the walls that almost every time we change in order to welcome a new exhibition and create the color atmosphere needed. EBR: What are the future goals for IAMY? NA: Our future objectives, except for any other major scientific avocations with the archival and permanent historical collections and our care for the spotlight, viewing and their safe keeping, is also our continuous offer to the contemporary art by organizing and presenting exhibitions, but also in the field of music, dance and theater with the Organization and presentation of relevant always high quality cultural events. EBR: What are the visiting figures of IAMY each year? NA: Each year, around 18,000 to 20,000 guests, Greeks and foreigners, visit our premises. Also the visit of organized groups is, as well as students from all primary and secondary schools. I would say that the kind and style of our Museum (historical) attracts a larger number of Greeks than foreign visitors while noticing that we have frequent visits from Northern Greece and Cyprus. EBR: How can visitors be more updated on IAMY news? NA: Before answering your question, I would like to tell you that the Historical Archives-Museum of Hydra is a purely Public Service, regional service of the General State Archives that belongs to the competence of the Ministry of Education, Research and Religious Affairs. Taking care for the continuous public information of visitors we distribute immediately upon entering our special brochures in Greek and in English with full tour on our premises. Also any visitor can refer on our website (www.iamy.gr) where there is a daily update on the operation and events as well as on our page on Facebook titled Historical Archives – Museum of Hydra/General State Archives. EBR: Under which efforts and funds can large exhibitions be developed? NA: Efforts towards organizing large exhibitions are continuous and never ending! Ongoing discussions with prospective exhibitors, research, negotiations, ensuring conditions and funds anguish. So far the costs of major events that have taken place in our premises and even those events involve international partnerships (Switzerland, Spain, Canada, Argentina etc.) are covered by their own exponents. Also important is the financial support in our Museum of some Greek artists even in exhibitions that do not relate to their work. EBR: What can someone attend during a first visit in IAMY? NA: First of all, the permanent collection of historic relics kept and displayed in our premises. Among these on the exhibition premises on the first floor is exposed the great Map of Greece of Rigas Feraios, the seal of Napoleon III Bonaparte, the embalmed heart of Andreas Miaoulis, ship figureheads of the ships of the Revolution, weapons and costumes of the fighters of the Revolution, personal documents, photographs, personal objects and costumes of the Admiral Pavlos Kountouriotis, art of the 18th-19th century, historic paintings of great painters etc., a large collection of archival documents, photos etc. On the second floor a collection of ancient objects derived from surface is exposed, mainly researches in many points of Hydra and amphorae from maritime excavations. And of course in the actual exhibition rooms the visitor can enjoy contemporary art through the eyes of our artists. EBR: How has your love for art been originated? NA: My love for Art I think it started from the... beginning of my existence! Always I was attracted by the nice and aesthetically impeccable in all aspects of my life and I was trying to tone in, of course, as much as possible about it!. From schoolgirl already, on the latest classes of high school and later even as a student at the University of Athens, i was watching exhibitions on various Galleries of Athens. The science of Archaeology which I chose and with which I dealt through excavations for several years is I think a factor, a sine qua non for the cultivation of love for the beautiful and artistic!! Crucial however stood the 25-year, closely acquainted friendship with the great colorist of our era, which sadly is no longer with us, the late Panagiotis Tetsis. Close to him, and close to the circle of his students and his exhibitions i became even more... fanatical! My acquaintance and friendship also with the late Nikos Papadakis and his wife great ceramist Eleni Vernadaki but also with many other great painters, older and younger, Caras, Veroucas, Fassianos, Mavroides, Katsoulidis, and many others, inevitably led me down the path of love for art and its people. EBR: How can the separate units of thematic areas into the museum influence the visitors’ preferences? For example, there are some exhibitions or collections more popular than others, how do you handle it? ND: If you ask me for the coexistence of old and new, I assure you that this pairing, this "marriage" of the past with the present through historical exhibits on one side and modern works of art on the other side, almost always excites the visitor since he has the possibility of regurgitation and alternative approaches to the content of our Museum. 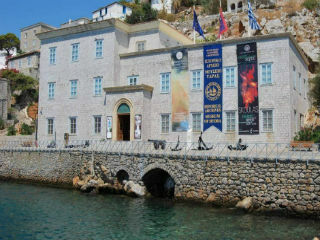 EBR: What is worth visiting the Historic Archive and Museum of Hydra for the following period? What are your next plans? ND: The exhibitions that we are discussing, planning and organizing are in total 3 or 4 but very important. Allow me, however, because we are still in the process of research and discussions mainly to secure resources for their implementation, to not refer by name to each of them. Also the next summer season we will be accompanied by several others, not only exhibitions but also events, workshops, conferences, book presentations, musical and theatrical performances, etc. EBR: French Week on Hydra was of a great success and appreciation. It consisted a great initiative on your part & an exchange of culture hosted by IAMY - would you believe that by this way museums can play a role of collaboration between nations and take active action to the oppositions of current reality? NA: I think museums can literally remove the borders, eliminate hostility and racial differences through this "Exchange" of cultures in which you refer… This approach of people, lifestyle, methods, attitudes through art blunts the existing and brings closer man one to another. French Week indeed left excellent and very nostalgic impressions to us and especially to our visitors. Of course, in order to accept and welcome in our premises this “exchange” of culture we took great initiative not only by us, but also by the great painter Alexis Veroucas, whom I warmly thank from this position and whom we honoured in the recent us event. This is because our desire and our belief is to honor and award of the offering, from wherever it comes!! EBR: Financial crisis has also a great influence on the IAMY affairs? NA: I would say not... Clearly as to all museums, moreover, had declined in recent years, the incoming public but this year things were very encouraging, visits increased, ongoing events have brought us many visitors and on the island and Museum and our Museum Shop objects found ardent shoppers with whatever this means economically. EBR: Which are the reasons for someone to visit the IAMY? NA: The significance and value of the historical relics of the permanent collection, many high-level events that are always being presented each summer, the warm, friendly atmosphere and the fact that each visitor within our premises can seek and ultimately discover its historic identity. EBR: Do you believe that EU has contributed to a cultural integration? NA: The "architect" of the EU Jean Monnet had once confessed that "if he could re-start Europe, he would start from culture ...!!" It is indisputable fact that we are the Union of 27 Member States with common borders, with common policies and institutions, common currency, common in general course. Culture is a domain with a humane dimension, a common "language" for all Europeans and clearly culture supported temporal life of Europe. The need for the EU and its common course is well grounded in culture, and the EU looks forward to its catalytic benefits. Therefore the care and effort to stimulate and promote culture should be continuous. EBR: Is there a European culture, in your opinion? NA: Indisputable fact is the existence and the effort of diffusion of a European culture in my opinion. Culture however that should become broader and deeper. And to do this, the EU Member-States should not only accept and adopt neither to stand on things that separate people between them, after all the actions and ideological residue of centuries of Colonialism, but all European people through culture always as a central pillar, should try to consolidate the cultural values and join the different evaluative opinions on the European North-South and West-East.